TWG Singapore - Luxury Teas - Sweetheart Tea Set - 2 x 3.5oz Loose leaf Caviar Tin's • A loving duo of French Earl Grey, a fragrant TWG Tea black tea delicately infused with citrus fruits and French blue cornflowers, paired with Polo Club Tea, an aromatic TWG Tea green tea which infuses into an emerald cup inflected with soft notes of sweetness. 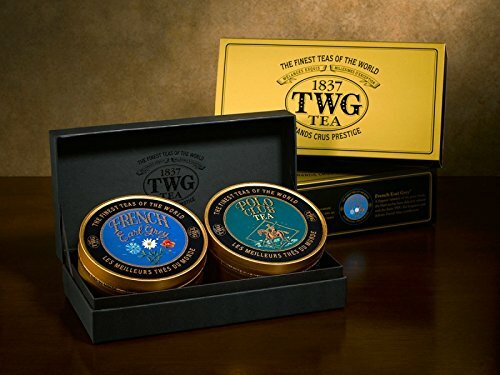 • French Earl Grey - A fragrant variation of the great classic, this TWG Tea black tea has been delicately infused with citrus fruits and French blue cornflowers. • Polo Club Tea - Gather strength from this aromatic TWG Tea green tea which infuses into an emerald cup inflected with soft notes of sweetness.